Although you can apply a Shape Curve to a morph, the actual moving track of a key dot from Image 1 to Image 2 is still a straight line. Now you can use a real curve as morph track instead of previous straight lines. You'll find that you can easily create very different and amazing morphs with Track Curve. 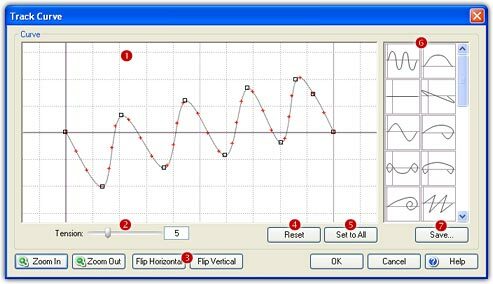 Choose the Sequence/Track Curve menu to open the Track Curve window. The track curve is specified by a sequence of control points and smoothly passes through each point in the sequence. There are at least two control points on a curve. The red cross on the curve marks the position of each frame. You can zoom the workspace by using mouse wheel scrolling or clicking the Zoom In or Zoom Out button, and you can drag and drop to pan the workspace. Add Point: Click anywhere in the workspace ( ) to add one control point. Move Point: Drag and drop a control point to move it. Beginning with version 5.0, the start point and end point can be moved to anywhere also, for professional users, this makes it possible to create Anti-Faces and Caricatures. Delete Point: Right-click a control point to delete it. Tension: Drag the slider ( ) to adjust the curve tension or directly type a value from 0 to 20. Flip: Click the Flip Horizontal or Flip Vertical button ( ) to produce horizontal or vertical mirroring of the curve. Reset: Click the Reset button ( ) to clear the current settings and back to the original status. Set to All: Click the Set to All ( ) button to apply this curve to all sequences in the current project. Load Curve: Load a curve in the curve library ( ) by double-clicking, then it will be displayed in the workspace immediately. Save Curve: Click the Save button ( ), the current curve in the workspace will be saved to the bottom of the curve library. Delete Curve: Select a curve in the curve library, then press Del key to delete it. You can launch Track Curve as well as Feature/Shape Curve window at the same time. You can edit the curve while the morph movie is playing, which means you will immediately see the effects on your final morph. Track Curve is only available in FantaMorph Deluxe.